After the maturity exams, I badly wanted to go all in with my language skills. Yet it didn’t happen. I miscalculated and back then aimed too high. My English wasn’t sufficient enough to earn a cozy place at the university – painful perhaps but certainly true. Reality stomped confidence fuelled by pride. That’s what happens to youngsters with a bad attitude. But it was a mistake badly needed. Failures shape character, at least for some of us. My lesson was learned the hard way but learned nonetheless. People divide into two groups. In time of great crisis, some get devastated, shocked and numb. Others will, in their biggest and priciest failures, see a terrific wake-up call. Clearly I was the only one to blame. At that time I was already aware also of my fair sculpting skills. Someone from the family was in the dental prosthetics business. It all added up neatly. Shortly the cat landed on its four feet. School was finished, the diploma received and joy rightfully earned. That kind of achievement creates more courage and motivation. Instead of taking the easy opportunity, I decided to leave my comfort zone and try something I always wanted in the first place: writing. Chasing down the rabbit hole was exciting especially if there was candy at the very beginning. In the worst case scenario, I had a place I could return to. That was a clear win/win. 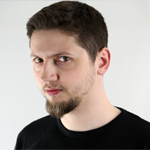 PS: Dawid is the co-publisher/owner of the Polish online magazine HifiKnights.com. As such he routinely submits articles for syndication.